"Being an incomplete study of the Daedric Princes, their characteristics, their worship, and deeds, as compiled from recognized scholarship." 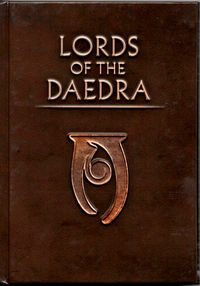 Lords of the Daedra is a small book that was included in the October 2017 Loot Gaming crate, which was "Demon"-themed. Similar to the Elder Scrolls V: Skyrim - The Skyrim Library series, it is a collection of lorebooks from the game, paired with concept art and screenshots. Though Varieties of Daedra appeared in Skyrim as a single volume - and Lords of the Daedra was listed on the crate's poster of contents as a Skyrim tie-in - the story is split into two parts, as it appeared in The Elder Scrolls Online. This page was last modified on 31 October 2018, at 17:51.